FILE - U.S. President Barack Obama, right, smiles after a group of children waved flags and flowers to cheer him during a welcome ceremony with Chinese President Xi Jinping at the Great Hall of the People in Beijing, China . Amid questions about China’s currency manipulation and its behavior in cyber space, U.S. administration officials are highlighting common areas of interest as President Barack Obama prepares to welcome his Chinese counterpart, Xi Jinping, to the White House this month. “Whether it’s on climate issues or confronting Iran over their nuclear program, we have been able to effectively coordinate with the Chinese to advance the interests of the citizens of both of our countries,” White House press secretary Josh Earnest told reporters Monday. Cooperation on climate change is the focus of the two-day U.S.-China Climate Leaders Summit that began Tuesday in Los Angeles, where officials from both countries will share best practices for reducing carbon emissions. The meeting is a follow up to the joint announcement on climate change made during Obama’s visit to Beijing in November of last year. 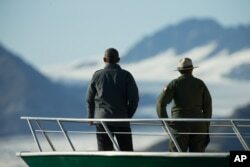 President Barack Obama, accompanied by a National Park Service employee looks at Bear Glacier, which has receded 1.8 miles in approximately 100 years, while on a boat tour to see the effects of global warming in Resurrection Cove, Sept. 1, 2015. The United States announced a goal of reducing carbon emissions by 26 to 28 percent below their 2005 level by 2025. 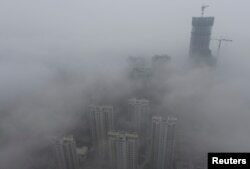 China committed to peak its carbon emissions by 2030. “This year needs to be a year of implementation, and a year when our two countries demonstrate our commitment to implementing and executing against those goals with ambitious, concrete steps to reduce our carbon emissions in a way that moves our economies forward,” senior White House adviser Brian Deese said. U.S. officials say Vice President Joe Biden is set to lay out important actions on climate change when he speaks to the summit Wednesday. During the California gathering, cities, states and provinces from the United States and China will sign a climate leaders declaration, agreeing to take parallel steps to address climate change. Atlanta, Boston, Los Angeles, Seattle, Houston, San Francisco and Washington are among the U.S. cities that will join the declaration. About 11 Chinese cities and provinces, including Beijing, Guangzhou and Shenzhen, will also sign. The agreement is the first of its kind between multiple community leaders in the two countries. Buildings are seen shrouded in heavy haze at Qingdao development zone, Shandong province, February 25, 2014. Chinese cities that have set peak years for carbon dioxide emissions earlier than the national goal of 2030 have formed an alliance as part of the declaration. “This is important because the commitment to early peaking by so many mega-cities in China highlights the fact that the country as a whole is moving to achieve its national goal as early as possible,” Deese told reporters in a press call Monday. The White House says China’s Beijing and Guangzhou have committed to peak their carbon dioxide emissions by the end of or around 2020. Officials say commitments by Chinese cities and provinces represent approximately 1.2 gigatons of annual carbon emissions, about a quarter of China’s urban total, and roughly the same level of emissions as Japan or Brazil. American cities, counties and states are making their own commitments. California has set a goal of reducing emissions by 80 to 90 percent below 1990 levels by 2050, and Seattle has pledged to become carbon-neutral by 2050. The summit will also focus on cooperation on a local level with Los Angeles and the Chinese cities of Shenzhen and Guangdong sharing ideas on the construction of green buildings, while exploring ways to expand trade in clean energy. “The commitments that the Chinese and American cities are taking as a part of this summit are a very important component of our broader efforts by our two countries to deepen climate cooperation and to show that the two largest emitters in the world are taking seriously our obligations to meet the ambitious goals we set out last year,” Deese said.